While I will not go into detail on the field stripping of each pistol, I will rank them for ease of disassembly and maintenance, with a few comments. Number one is easily the Glock. It takes but four seconds to strip the pistol down. Little residue is left inside the pistol when it fires. Lubrication needs are minimal. It can take a lot of abuse and neglect and still keep firing. Its finish is weather-resistant. It’s the standard by which all the others are judged. Number two is the H&K. 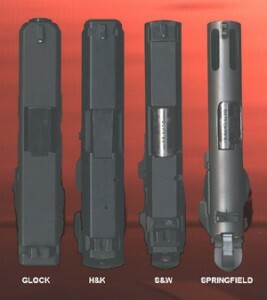 Slightly more complex than the Glock to disassemble, it still can be done quickly and easily. The lube points needing attention are few. Like the Glock, it’s “clean shooting,” leaving very little crud inside the pistol to brush out, and its finish is durable and largely rust-free. Number three is the Springfield. Anyone familiar with the 1911 design can field strip it blindfolded, although it’s more involved than with the Glock or H&K. Lubrication and cleaning needs are more demanding and time-consuming. The pistol can be completely disassembled without tools if need be, a feature the other pistols cannot offer. The stainless and aluminum finishes are easy to maintain. Number four is the Smith & Wesson. The disassembly and reassembly of this pistol are the most complex and it requires care to do it right. Small levers have to be depressed in order with some sort of tool before the slide can go back on the frame. Lube points are numerous. Some minor parts are almost inaccessible for cleaning. Disassembly and assembly are not really difficult, but there is a learning curve to be achieved first. The drill is the worst of the four.